As summer approaches and our lifestyles increase in activity we all want to maintain a simple beauty routine while still staying on trend. Who wants to spend lots of time only to sweat it off? Here are some great products I have found to help keep my summer beauty routine quick and easy and trend-worthy. 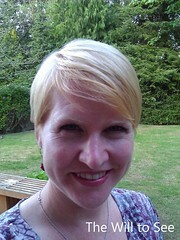 Sun-kissed Hair – Since I moved to the Pacific Northwest I have noticed that my blond hair is not as blond as I want it. I just can’t commit to the time and expense of coloring my hair and had started to give up my will for bright blond hair. Then I found my answer, John Frieda Sheer Blond Go Blonder shampoo, conditioner and lightening spray. The spray probably does the most, but I have used them all. They have brightened my natural color and made me feel like I have that sun kissed look without being in the sun. Natural Skin – I wear moisturizer with sunscreen every day, but rarely use foundation. I find it heavy and cakey on my face. One thing I am thinking of trying this summer is a tinted moisturizer to even out my skin tone a bit, but still have light coverage. Then I apply sunscreen over it if we are going to be in the sun. I have very sensitive skin on my face, so I am picky about my sunscreen. I have found that Aveeno Baby Continuous Protection works well for the kids and me. Simple Makeup – When it comes to makeup I will put on mascara most days, because I have light eyelashes and would look quite pale without. Add a little lipstick for afresh and natural look. I love Cover Girl Outlast All-day Lipcolor. It stays on all day and doesn’t come off on food, drink or significant others. You put the color on, let it dry (usually only 30 seconds) then put a moisturizing top gloss over it. It is so great and comes in almost any color you could want. Hopefully these tips will help you simplify your summer beauty routine while staying on trend, so you can get out and enjoy the long warm days and nights.